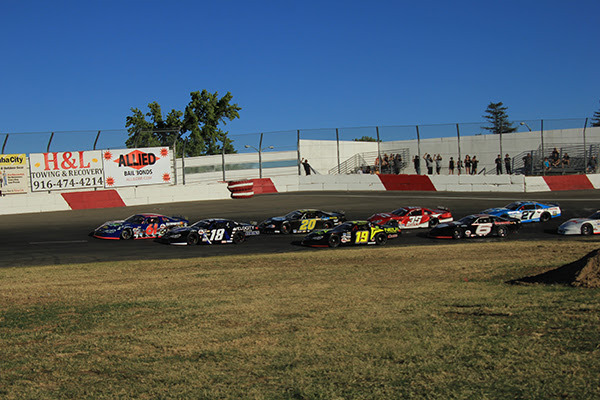 For the fifth straight year, The Official Beer of Kern County Raceway, Budweiser presents the NASCAR Whelen All-American Series Championship Season Finale this Saturday Night. ​Track Championships in four NASCAR Divisions will be decided on this exciting night of racing and family fun. 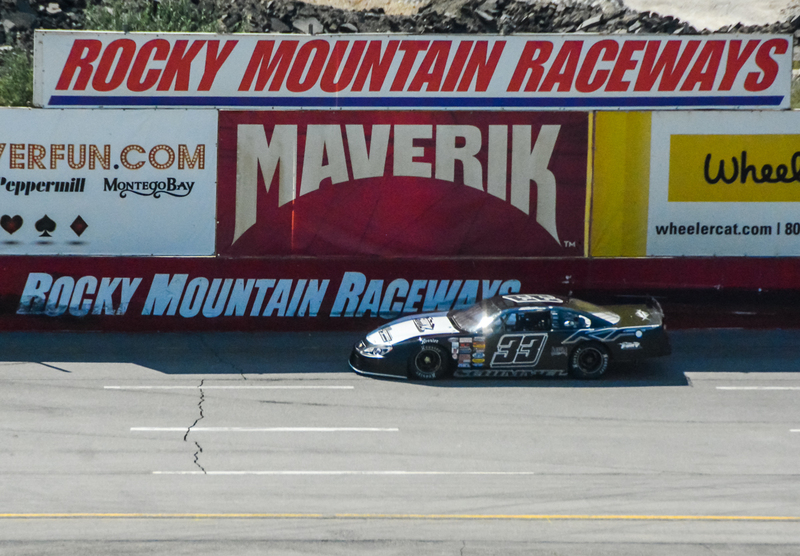 ​Highlighting the evening will be the NASCAR Late Models, the top stock car division at Kern County Raceway. Going into the final stretch, Trevor Huddleston leads the points as he chases the Track, State and National NASCAR Championships. The defending track champ in the NASCAR Mini Stocks, Damien Leininger is in another close battle for the title as he and Brock Melo are separated by just 6 points going into the final race. ​Jim Coffey, a long time Les Schwab Tires Spec Mod Driver is in the catbird seat, leading the points and enjoying his best career year. The INEX legends will also crown their champ on this night. It's been all about Luis Tyrell in 2017. The Northern California driver has been undefeated this season and will be tough to beat in the finale. Kern County Raceway is proud to partner with Budweiser, Bulwark FR, Coca-Cola, Jim Burke Ford, Advance Beverage Company, NAPA Auto Parts and Whelen Engineering. STOCKTON, CALIFORNIA (September 11, 2017) – Points race #12 of 14 at Delta Speedway Stockton for 2017 hits the track on Saturday night bringing race fans another dose of Micro Sprint excitement. Super 600, Non Wing, Restricted, and Jr. Sprints compete on the 1/7th mile dirt oval at the San Joaquin County Fairgrounds. The 2017 season has been one for the ages in the 31st year of the facility, with one of its highest weekly car count averages in track history. 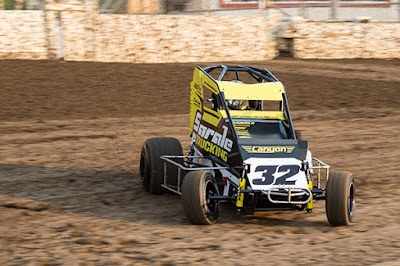 Drivers were busy over Labor Day Weekend with the Dual at Delta presenting full points races both Saturday and Sunday nights with very warm temperatures. More seasonal weather is expected this weekend. 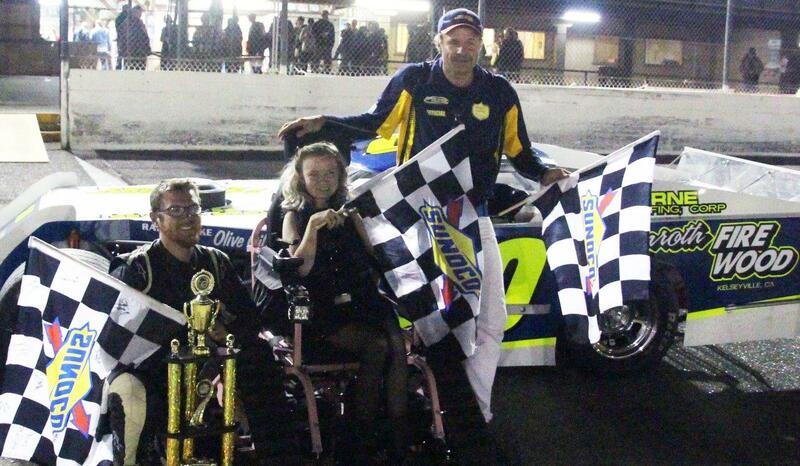 Raio Salmon leads the Super 600 standings in her first full season at Delta Speedway. Her victory during June’s Summer Sizzler has been joined by three other podium finishes and a fourth place finish during the Dual. Jake Andreotti is second in the standings just 22 points behind with also one victory. He finished 20th on both nights of the Dual however. Mason Daniel, Keith Day, Jr. and Alex Panella round out the top-five in the points. September 3rd fast time qualifier Nikko Panella has moved up to sixth despite a late start to his Super 600 season. TJ Smith’s win and second place finish over the Dual maintained his points lead at 39 points over Fresno’s Koen Shaw in Non Wing. 2016 Non Wing champion Brandon Carey is third followed by 2015 Restricted champion Caden Sarale and multi-time track champion Dan Mognaga. Restricted has maintained a very large car count for the drivers ages 10-16 with Garth Kasiner still atop the points standings despite not visiting Delta victory lane since June 17th. Corey Day has two wins to advance to within 41 points of Kasiner. Caeden Steele, Oregon’s AJ Harbaugh, and Katey Syra round out the top-five with Napa’s Brody Petrie and Elk Grove’s Ashlyn Rodriguez not far behind either. Isabel Barnes is working on a rare second Jr. Sprints championship as she tries to add 2017 to her 2015 accomplishment. Barnes lead on Caleb Debem stands at 48 points with rookie Jacy Sarale up to third. Sarale has a four point cushion over Jackson Kohler with Karter Velasquez closely following in fifth as well. Super 600 and Non Wing competitors race 30 lap features while the Restricted main event is 25 laps and Jr. Sprints 20 laps. The three full size divisions qualify and run 10 lap heat races, while the Jr. Sprints run a pair of heats per driver in lieu of time trials. On Saturday, gates will open at 1:00 p.m. Tickets are $10 for adults, $5 for kids 6-12, seniors 55+ and military, with kids 5 and under free! Pit passes are just $20. The drivers' meeting will be at 4:30 with hot laps, qualifying, and racing to follow. Race fans are invited to come early and stay late for great Royce Farms BBQ at the track concession stand in turn four. Delta Speedway will have copies of WE ARE DIRT the movie on sale as well. For more information on Delta Speedway, follow us online at www.deltaspeedwaystockton.com or on Facebook, Twitter, and Instagram. Many thanks to Golden State McDonald’s, Tuleburg, Interstate Truck Center, Hoosier Tire West, Morrill Industries, Van De Pol Petroleum, Von Euw Trucking, Fremont Plaza Ace Hardware, Country Club Ace Hardware, Sanborn Chevrolet, Bruno's Peppers, Price Rite Restaurant Equipment, Genova Bakery, Lovotti Air, Financial Center Credit Union, and Motion Media for their loyal support of Delta Speedway! Eureka, CA (September 9, 2017) – It was another action-packed night of racing at Redwood Acres Raceway this past Saturday night. It was Bear River Casino And Resort Night at the Races and joining the usual crowd of roadrunners, Legends, bombers, mini stocks and Thunder Roadsters was the North State Modified Series which made their third and final stop at the Acres in 2017. In the California State And Federal Employee’s Credit Union roadrunner division, Daniel Buell set fast time in qualifying with a 20.664. The first lap of the first 20-lap main was run backward with Andy Savage leading the first lap. Tim Ratzlaff took the lead on lap two before giving way to Tim Buzzard, Jr. on lap three. Lap four saw Ratzlaff and Savage hit the wall forcing both drivers out of the race. The final 10 laps featured a thrilling duel for the race win between the Buzzard and Buell. The two went back and forth for the lead several times before Buzzard took control on lap 18. Buzzard was able to hold on from there to take his first main event win in the roadrunners in 2017. Buell placed second while Dennis Anderson, Jennifer Murrell and Nick Ford rounded out the top five finishers. The second main got started off with Ratzlaff leading. On lap three, Ford took over. Ford and Anderson traded the lead midway with Ford maintaining the lead. In the closing laps, Buell made himself known as he moved into second. On lap 19, Buell moved past Ford to take the lead. From there Buell took the checkered flag first. Ford placed second over Anderson, Murrell and Buzzard. Qualifying for the Nor-Cal Automotive Legends class was led by Brad Curtice with an 18.081. Curtice took the trophy dash win while Robert Miller won the heat. The 25-lap feature started off with an unfortunate accident that took out Mkinzy Uselton. Robert Miller jumped to the lead on the restart while Curtice moved to second. The two played a cat and mouse game between each other until the final lap. Going into the third turn, Curtice moved under Miller to try to take the lead. The two drivers locked together coming off turn four. The incident allowed Tyler Peach to drive by and take his second main of the season. Miller was able to get second followed by Tyler Krupa, Curtice and Uselton. James Moore was fast time in the Fortuna Wheel & Brake bomber division with a time of 18.382. The four-lap dash was won by late model veteran, Mic Moulton who was subbing for John Lally. Jeff French took the heat race win. Jimmy Sorrels led lap one but Moulton moved by on lap two. The big turning point in the race came on lap four when several drivers spun in turns three and four including Moulton. French made a daring three-wide pass to take the lead. From then on French was able to run away from the field. At the checkered flag it was French getting the win over Jim Redd, Moulton, Kolby Jackson and Bethany Rapp. The Humboldt Hydroponics mini stocks were paced by Brett Murrell in qualifying as he times in with an 18.840. Scott Taylor won the dash while heat race wins went to Trevor Eacret and Murrell. Brian Murrell, Jr. led the first two of 25-laps in the main event. On lap three, Trevor Eacret took over. While Eacret led the most laps, a lap 20 restart did him in as he got loose and into Brian Murrell, Sr. Jordon Paiment took over and showed surprising speed in his new ride. Paiment was able to hold off a late race charge by Brett Murrell to take his first-ever mini stock main event win. Brett Murrell took second over Taylor, Eacret and Eugejne Palmer. After several years away from racing, Alan Olson was able to set fast time in the Lone Star Junction Thunder Roadster division with a 17.391 time. Tommy Payne came through in the trophy dash and heat race to win. The 30-lap main saw thrilling racing between Payne and Chris Lawrence. The two raced wheel-to-wheel before Lawrence took over. O’Neil moved to second on lap seven and set his sights on Lawrence’s lead. The front two had an exciting but clean race for the top spot. With four laps remaining, O’Neil finally got under Lawrence to take the lead. Payne and Olson were able to follow through. At the finish it was O’Neil taking the victory. Payne placed second with Olson, Paul Baker and Lawrence finishing the top five. Over 20 North State Modifieds made the trek to the Acres. Darrin Knight set a new track record with a 16.064. The Lucas Oil Dash for Cash was won by Tom Elam, giving him 100 dollars. Jeremy Kay placed second in the dash which earned him 50 dollars. The field saw a 10-car invert which gave Willie Thompson pole position. Thompson led the 10 laps before hitting the wall. The race’s only caution came a lap later when Thompson couldn’t get to the pits. Kyle Tellstrom was driving Richie Potts’ car for the night and took the lead briefly before Knight took over. Knight clearly had the dominant car as he pulled away through the long green flag run. The best action was the battle for second between Tellstrom and Sierra Furia. The closest incident that nearly brought out the yellow flag was contact between Eric Johnson and Charlie Collins down the front stretch. Fortunately, neither car suffered significant damage and both drivers were able to make it to the lap 60 finish. Furia had transmission issues in the final handful of laps which cost her the third position. At the checkered flag it was Knight winning by nearly ¾ of the track. Tellstrom placed second over Randy Houston, Furia and Terry Deal. Only six cars finished the race on the lead lap. Eureka, CA (September 11, 2017) - Going into this past weekend, young Mkinzy Uselton was only four points behind her title rival, Tyler Peach in Redwood Acres Raceway Legends division point standings. Uselton entered the evening only four points behind Peach in the championship standings. Unfortunately, an incident at the start of the main event diminished her chances. Uselton spun off turn four and hit the wall hard. While the driver was okay, her car was severely damaged. Initially the MK Racin’ 29 Team thought that it was the end of the season and the championship due to the heavy damage on the car. Fortunately, the crew was able to determine that the 29 Legend was fixable and will be able to finish out the season on RAR’s last weekend of racing, the Fall Spectacular. While she faces longer odds going into the September 1st and October 2nd event, Uselton will still be able to win Redwood Acres Raceway’s Legends division title. Before the end of the season of pavement racing ends for Uselton, she will be racing at the Acres 1/10th-mile dirt track. Mkinzy and her younger sister Aaliyah will be in action this coming Saturday September 16. Mkinzy will behind the wheel of her 250 kart while Aaliyah will be racing her box stock. Both are rookie racers in outlaw karts. 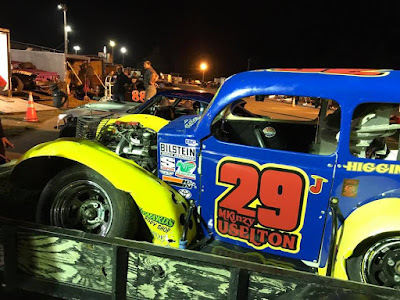 The Uselton sisters are the granddaughters of former real stock and sportsman division driver Lissa Uselton who was a fan favorite during her time behind the wheel. Mkinzy’s Legend race team is led by her crew chief and grandfather, Brett Uselton aka “Papa” who also serves as crew chief on her kart. Uselton’s 250 kart is owned by Fredy Champagne and is also crew chiefed by Wayne Fisher aka “Pepper”. The rest of the MK Racin’ 29 Team is made up of Jim Jameson, Jim McIntosh, Lissa Uselton, Aaliyah Hughes Mitchell and Unk B. Sponsors for Uselton are Jim Redd Four Star Realty, Verizon in Fortuna, CA, John’s Used Cars, Left Coast Vinyl, Central Office and Red Boots Racing & Mrs. Moulton. September 9, Eureka CA ...... Race #9 of the North State Modified Series, presented by Protect the Harvest, was all about Kelseyville's Darrin Knight. Knight dominated the action by first setting a new track record of 16.064 seconds (the previous record was set in 2014 by Jay Linstroth of Citrus Heights.) Then he started 10th in the Bear River Casino 60 lap feature and led the final 40 laps to capture this third NSMS season feature at Redwood Acres Raceway in Eureka Saturday night. Knight's victory was good enough to regain the points lead which he had lost two weeks earlier to Charlie Collins of Upper Lake. When Knight pulled the #10 pill for the main event invert, Willie Thompson and Potter Valley's Simi Tour found themselves on the front row for the start. Thompson forged ahead at the drop of the Johnny Miskill green flag with Tour, Dustin DeRosier, Kyle Tellstrom (driving the Richie Potts #83), Houston and Sierra Furia next in line. Tellstrom shot by DeRosier on lap two, and both Houston and Furia drove under DeRosier the following round. Tellstrom moved to the outside and drove by Tour for second on seven as Knight was picking off cars on each pass. Knight caught the leaders, and on lap 13 Thompson's car pushed high opening the door for Tellstrom to poke his nose in the hole and take over the lead. Knight followed Tellstrom, moving along side of Thompson when the two made contact. Thompson slowed, and two laps later stopped at the pit exit gate to bring out the only yellow flag in the race. Knight powered into the lead on the restart, dropping Tellstrom to second. Furia held on to third with Houston fourth and Deal fifth. Eric Johnson and Collins were battling for the sixth spot as Knight was pulling away from the pack. Furia stayed tight on Tellstrom's tail, hoping for an opportunity to gain ground, but Tellstrom drove a steady line. The second half saw Knight lap an average of one car every other lap as the battle continued with Johnson and Collins. Finally on lap 52 Collins and Johnson crashed together and it slowed Collins down just enough for Sullivan to gain position. Furia's transmission popped out of gear in the final stages allowing Houston to take over the third slot. Furia drove with one hand while holding the shifter in place the remaining distance, and at the checkered flag it was Knight, Tellstrom, Houston, Furia, Deal, Johnson, Sullivan, Collins, Andreotti and Elliott.